The last and arguably ultimate Star Wars space combat simulator. Although it was released in 1999, several mods are available that freshen up the appearance while retaining the surprisingly deep gameplay. (Roughly) recreating the Starfighter Assault on Fondor from the Star Wars Battlefront II Beta in X-Wing Alliance. This video includes several clips demonstrating the shader mod that provides a significant graphical boost! This file contains the ReShade *.ini configuration file and a custom LUT ("Look Up Table") needed to achieve the correct "shader mod" effect. Instructions are freely provided below, from one enthusiast to another. However, follow them at your own risk. Many game files will be modified in the process, so do not proceed unless you understand what you are doing! These instructions were developed with an original CD version of X-Wing Alliance. They may or may not work for the Steam/GOG versions. Purchase + Install "Star Wars: X-Wing Alliance"
Currently available for around $10 from Good Old Games (gog.com) or Steam. The version used by this website is the original CD release (although it is more difficult to get installed and running on 64-bit machines). Download + Install the "X-Wing Alliance Upgrade Craft Pack"
The XWAU project has been upgrading the 3D models used in the X-Wing Alliance game for years. This is a link to the download page where a compilation of updated 3D models can be downloaded. Look for the "XWAU Craft Pack v1.3" (or newer). ReShade is an "advanced, fully generic post-processing injector for games and video software". It allows for the impressive shader effect described on this website. The shader configuration files provided on this website for X-Wing Alliance are designed for ReShade 3.08. Make sure to click on the correct download link! Install ReShade following its instructions. Make sure to select "XwingAlliance.exe" as the game to apply ReShade to, NOT "Alliance.exe". -> Download the *.zip file of configuration files (either above or via the button below). -> Then move the "XWA_FX_Settings.ini" from the downloaded config *.zip file into the XWA folder. -> Navigate to the "reshade-shaders\Textures" subfolder in the XWA folder. -> Make a backup copy of the "lut.png" file. -> Overwrite the original lut.png file with the lut.png file from the downloaded *.zip configuration package. -> Select the *.ini file via ReShade (you may need to press Shift+F2). -> Use the Pause/Break key to toggle the shaders off when in the menu system (as it flickers heavily). 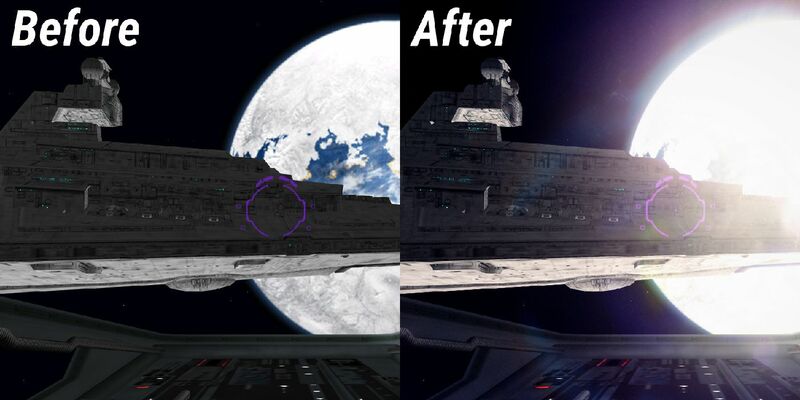 Disclaimer: These modifications for the PC game "Star Wars: X-Wing Alliance" are fan-made. LucasArts, LucasFilm, Disney, or the relevant Star Wars rightsholders are in no way affiliated with this site or its content. Star Wars is property of LucasFilm, Disney, and/or the respective rightsholders and is likewise not affiliated with this site or content. Using any of the files provided on this page is done at one's own risk. No responsibility is taken for any damage (whether direct or indirect) that is caused by the files, programs, or advice provided on this page. As always, it is recommended to backup important files before using any files provided here.